Kenya has two distinct types of season: the dry and the green. 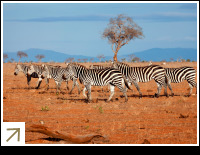 The dry seasons run from around January to March and July to October, and this is the best time to see animals as they converge on drinking sources and are not hidden behind greenery. The dry seasons, as you might expect, are also the most popular. If you want to see the Great Migration in Kenya, the latter dry season is the best time to do so, between July and October. The green season, is the opposite of the dry season. The landscapes are lush and green and there are not so many other tourists around. 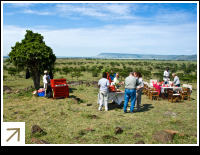 This is also the best time to book a more cost effective safari as the price of lodging during this time is generally lower. The light is fantastic for photography at this time, and the short heavy showers settle the dust. If you are interested in spotting some of Kenya's 1132 species of bird, January to March is the best time to visit. In terms of climate, given Kenya’s equatorial location, it is warm year round, however it can get chilly in the early morning and evenings. If you are planning to visit Mount Kenya you should be aware that near the summit it is snowy year round and temperatures can get down to as low as -10C (14F), so you would be advised to dress accordingly. Think of Kenya's coast and think of heat and humidity. Whilst the Kenyan coast is beautiful and recommended at all times of the year, the best time to visit the coastal area for a beach holiday is from December to March. During this time the Ocean breeze keeps the heat at bay and you are unlikely to encounter any wet weather. This is not the case from April to May and October to November, where the rainy seasons are in full swing, although it is still sunny for the most part.